Queensland police have released images of the area surrounding a truck explosion in Charleville overnight on the Mitchell Highway. THE catastrophic explosion of a truck carrying ammonium nitrate should not result in a ban on transporting dangerous goods on roads, according the Queensland Trucking Association. 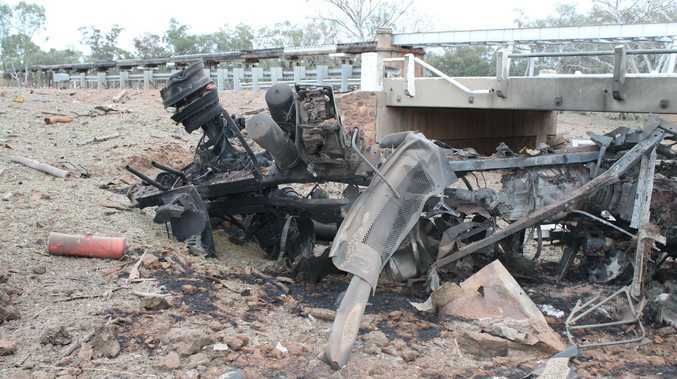 The explosion between Cunnamulla and Charleville on Friday was caused when 56 tonnes of ammonium nitrate mixed with diesel fuel after the truck hauling the load rolled, destroying a section of the Mitchell Highway, flattening two bridges and leaving eight people with injuries. Ammonium nitrate is an explosive and is strictly regulated by the Department Natural Resources and Mines under the Explosives Act 1999, but this does not stop its transportation via truck. 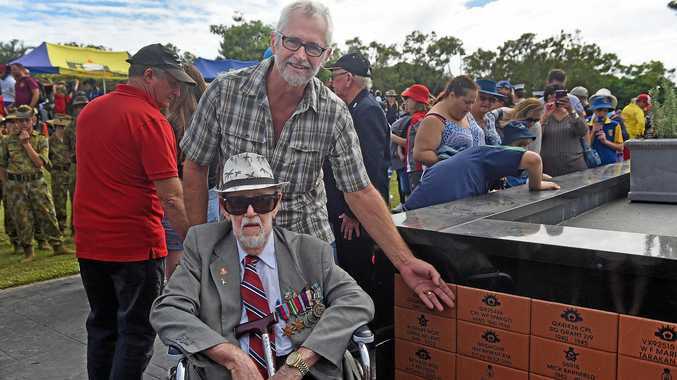 Peter Garske, the long-term chief executive of the Queensland Trucking Association, believes the state's rail network is too sporadic and inefficient to realistically freight explosive materials. He says tough controls are already in place. "The laws that currently regulate the movement of dangerous good and explosive products, well that is a task that is already highly regulated," Mr Garske said. The man injured after a truck carrying chemicals from Gladstone exploded at the weekend is fighting for his life in a Brisbane Hospital. The 33-year-old Mackay man had been transporting a chemical substance from Gladstone to South Australia when the truck exploded near Charleville. Eight people were injured in the explosion, which completely destroyed the area. Four firefighters, one police officer and two passersby were among the wounded. The four firemen injured while trying to save the truck driver are expected to make full recoveries. Two remain in Toowoomba Hospital while another two were discharged from Charleville Hospital on Saturday. Emergency service crews, who pulled the Mackay driver from the cab, have been praised for risking their lives to get the driver out.